Women often feel inferior because their legs are not good-looking. In fact, this is not necessary. By dressing up, women can create beautiful figures. 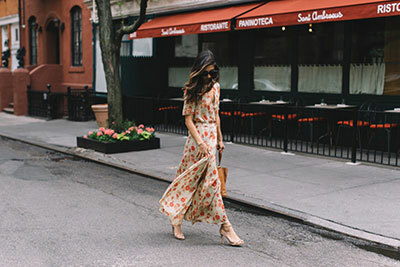 These three leg types are very much in need of the long skirt, the light, and elegant maxi dress brings a charming temperament, and covering some of the legs parts and won’t make you look short. Muscle legs will stick out particularly prominently on the calf, which greatly affects muscle lines. Some women with very thin legs will be more obvious, the width of the legs will be out of balance, and wearing a short skirt will not look good. In addition to the short skirt, the length of the skirt just past the knee on the calf is also very unfriendly. This type of girl should choose a long skirt with a skirt that can hide the calf, revealing a slender ankle, and it will look very elegant. At the same time, I suggest you need necessary to actively use muscle stretching to eliminate muscles to make you more temperament. This type of leg refers to the outward turning of both knees, resulting in an ankle that cannot stand naturally when standing. This kind of leg type will be forked when it is walking, and it looks less beautiful. Wearing a short skirt will be more obvious. In addition, the hip skirt is not suitable for this type of leg, there is no way to have an elegant feeling. Choosing a straight tube and a wide pleated skirt look less obvious. You can walk consciously in a straight line while walking. This type of leg is also more common, as long as the knees are difficult to put together, it will be more obvious after wearing a short skirt. The length of the skirt can cover the leg as long as it can cover the knee. Even a petite girl, as long as she can control the skirt’s long skirt, is actually higher than the pants. At the same time, we must also pay attention to the way to walk, not to be inside, will make the degree of leg bending become higher. Women with leg types that are not straight enough should avoid wearing tight-fitting jeans, which will make the leg shape more visible and will not have a modification effect. In contrast, a maxi dress is a more versatile piece that can wear a feminine gentleness. Long skirts with a pair of high heels, no one can see your true height.